TRAJAN AE quadrans. DARDANIAN MINES issue, DARDANICI, Pax standing. Rare. Under Trajan and Hadrian, a small series of bronze quadrans were struck in the names of the imperial mines the Balkans, at Noricum, Dalmatia, Pannonia, and Moesia (Dardania). These operations supplied metal for the mint at Rome, and these issues were likely struck for circulation within the closed communities around the mines (an early mine scrip, if you will, eliminating intrinsic-value coinage from the local economy to prevent theft). 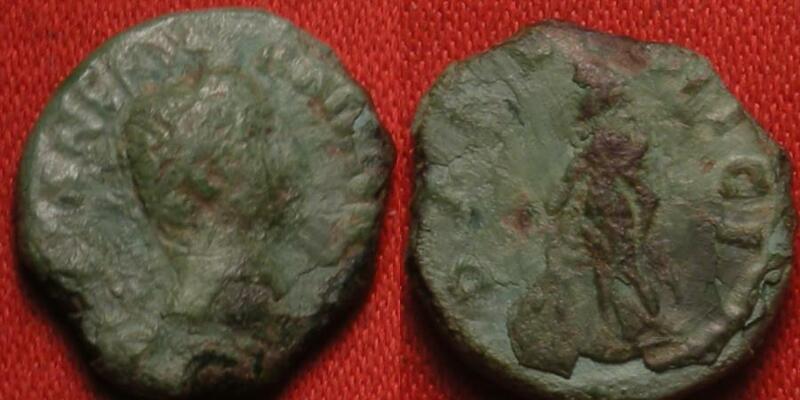 These 'mine issue' coins only appear during the Adoptive Era (Trajan to Marcus Aurelius). TRAJAN AE orichalcum sestertius. Felicitas standing left, holding caduceus & cornucopia. TRAJAN AE 28mm. Seleucis & Pieria, Laodicea ad Mare. Bust of Tyche wearing mural crown. TRAJAN AE dupondius. Trajan standing between two trophies of arms. Scarce.